The first corporate jet version of the A320neo has made a successful first flight from Hamburg, Germany. The test flight lasted 2 hours 40 minutes and took place on November 16, 2018. The ACJ320neo is derived from the A320neo airliner family. The corporate jet version includes features such as extra fuel tanks in the cargo hold to deliver more intercontinental range, plus greater cabin pressure for improved levels of passenger comfort. These features are being tested before the aircraft is delivered to Acropolis Aviation in the coming months. The aircraft will then undergo cabin outfitting in Basle, Switzerland, and be repainted in customer colours. 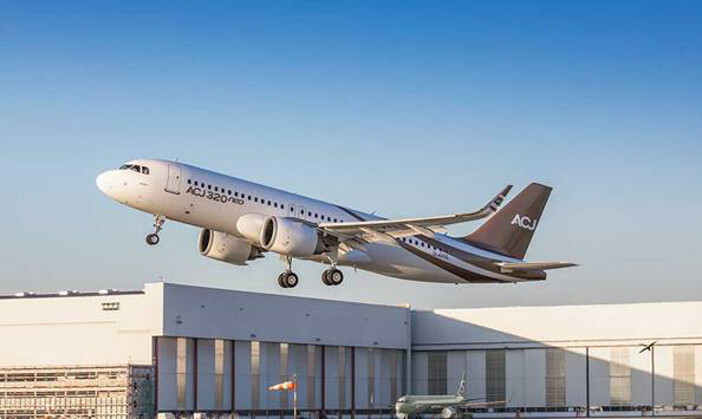 ACJ (Airbus Corporate Jet) president Benoit Defforge said, “The ACJ320neo first flight heralds a new Airbus corporate jet era, delivering a range improvement that enables non-stop travel between even more cities, in what is widely recognised as the best cabin of any business jet. “The ACJ320neo family’s improved fuel efficiency also means that it compares even more favourably in operating costs with traditional business jets,” he added. The ACJ320 family now comprises the ACJ319neo, which can fly eight passengers 6,750 nautical miles (12,500km) for more than 15 hours, and the ACJ320neo, which can fly 25 passengers 6,000 nautical miles (11,100km) for more than 13 hours. Both aircraft feature latest-generation engines and sharklet wingtips, and deliver more space than traditional business jets, according to Airbus.